Intended Use For Research Use Only in the United States. Not for use in diagnostic procedures. The MicroVue TRAP5b Assay is an immunocapture enzyme assay for the determination of tartrate-resistant acid phosphatase isoform 5b (TRAcP 5b) in human serum and plasma. TRAP5b (serum band 5 tartrate-resistant acid phosphatase, TRAcP 5b; EC 3.1.3.2) is a 35-37 kDa glycoprotein. TRAP5b is typically expressed in proportion to osteoclast activity and is secreted into circulation. As a result, serum TRAP5b is considered a potentially useful marker for bone resorption. 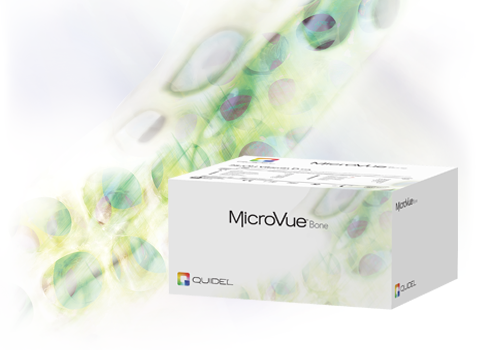 The MicroVue TRAP5b EIA detects the enzyme activity of bound TRAP5b in experimental samples. Doyon A, Fischer DC, Bayazit AK, Canpolat N, Duzova A, et al. (2015) Markers of Bone Metabolism Are Affected by Renal Function and Growth Hormone Therapy in Children with Chronic Kidney Disease. PLOS ONE 10(2): e0113482. Haegel H, Thioudellet C, Hallet R, Geist M, Menguy T, Le PF, Marchand JB, Toh ML, Duong V, Calcei A, et al. A unique anti-CD115 monoclonal antibody which inhibits osteolysis and skews human monocyte differentiation from M2-polarized macrophages toward dendritic cells. MAbs 2013; 5:736-47; PMID:23924795. Reactive with human derived TRAP5b only.